Milan has an excellent, well-organized system of public transport, which we want to tell you about here, but let’s first take a look at what you do when you have just arrived at the airport. If you’ve come to Milan by plane you’ve landed in either Linate, Malpensa or Orio al Serio. There are good connections with public transport from all three. Remember to buy your tickets before getting on either bus, tram or metro, they don’t sell tickets on board. Tickets can be purchased at either the Edicola (newsstand) or at coffee shops. In some airports there are automatic ticket dispensers at the bus stop. 1 ticket is €1,50 and is valid for 75 minutes. You can also buy a carnet with 10 tickets at €13,20, but you need one carnet per. person. Each adult with a valid ticket can bring 2 children under 11 for free. If your payment card or phone has the contactless function, you can buy tickets in the metro directly at the turnstile (only one at each station for now), if you use the same card more than 3 times in a day your ticket is automatically converted into a 24-hour ticket at €4.50. Linate is the airport closest to the city.The easiest is to take Bus 73 (which is a regular city bus that stops frequently along its route and doesn’t have a lot of space for luggage) or X73 – it is specifically for travelers. stops very few times and goes to Piazza Diaz (find on map) behind Piazza Duomo, so just a few steps from Duomo metro station. Currently a metro from Linate is under construction but there is no precise information on when it will be ready. We’ll update here once we know something more. Malpensa is Milan’s “new” airport which is about a 1-hour drive from Milan. You can either take the train (Malpensa Express) which goes to Cadorna in the center of Milan, One way tickets are €13 foma both terminal 1 and 2, a return ticket is only €20, if you purchase it online , or you can take the Malpensa Shuttle, which brings you to the central station (Milano Centrale) one way tickets are €10 – return tickets are €16. We recommend that you take the shuttle at the weekend but the train during the week, because you risk getting stuck in traffic jams with the bus. Orio al Serio is actually closer to Bergamo than Milan and it’ll take you about 50 minutes to get to Milan. There is a shuttle service which goes to Milan’s central station (Milano centrale). Tickets are €5 one way and €9 return. You can also take a the public transport bus (ATB) , which gets you to Bergamo central station in about 10 minutes and here you can get the train to Milan. The trip takes about 40 minutes and one way tickets are between €4-9. Here you must also consider that it’s a better idea to take the train during the week, because of possible traffic jams. As in every big city in the world you must keep an eye on backpacks and bags when in the metro, there are many pickpockets that operate there, taking advantage of the fact that it’s crowded. Don’t keep your backpack on your back. Hold it in front of you. Get the official app for Milan’s public transport (ATM Milano Official App) – read more about it and find the link to download here. IMPORTANT: Watch out for illegal taxis – the legal ones are white and have the Comune di Milano coat of arms on their front doors. If you need to call for a taxi and don’t speak Italian the easiest thing is to use the official app myTaxi. Read more about it and find the link for downloading it here. If, for some reason, you can’t get a taxi or just want a chauffeur in uniform you know is there when you arrive or need to be driven around town you can contact Autonoleggio CAPRIOTTI, mobile number +393482819594 or email address autonoleggio.capriotti@yahoo.it. Transport from the airport is the same rate as the fixed fares above. Milan has 4 metro lines, and a fifth is on the way, plus a lot of buses and trams. Other than the tickets mentioned above you can also buy a 1-day ticket for €4,50 or a 2-day ticket for €8,25. It’s important to know that although tickets are valid 75 minutes you can only access the metro once with a ticket. If you need to take the metro again you have to buy another ticket..
Metro tickets to the Fiera area cost €2,50 one way and €5,00 return. The most obvious thing to do in most European cities when you want a short break from all the hustle and bustle is to sit down at an outdoor café. But that’s not how the Milanese do it. Italy is the homeland of espresso and cappucino, but the prices are a mere fraction of what you see at e.g. Starbuck’s. You can get your coffe exactly as you like it, baristas here are used to special requests. Most other places a cup of coffee costs the same whether you enjoy it standing up at the bar, sitting down inside or taking it outside at the tables in front of the café. It doesn’t work that way in the south of Europe. The cheapest version of coffee is €1, if you drink it standing up at the bar, but it can cost up to €5 if you need to sit down and want it served at a table. Marrocchino – Morocccon (= cortado), a mini cappuccino, here with whipped cream. There are countless variations of coffee; an espresso can be lungo (long), ristretto (concentrated), macchiato (stained- with a drop of milk) macchiato caldo or freddo (wit warm or cold milk), cappuccino with eiter cow milk, soy milk or rice milk. During summer it is nice and refreshing to get an ice coffee or “caffè shakerato” (shaked coffee) instead of the traditional espresso.Prices range between € 3-7 depending on where you drink it and whether you stand or sit outdoors . There is also Affogato (drowned) coffee, a coffe based dessert with a scoop of vanilla or tartufo ice cream “drowned” by a shot of espresso coffee. It costs around €4-5. Then there is Cioccolata calda con panna – hot chocolate with whipped cream, which is a very different drink from the one you are used to, in Italy it is avery dense drink, more like a hot chocolate mousse, it’s delicious bbut be prepared for the difference. It costs around €2,50-3. We have lots of suggestions for where to drink your coffee in the different areas in Milan here. 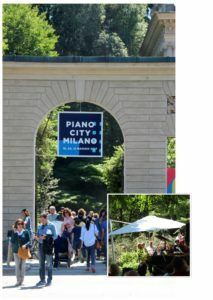 Milan’s municipality offers free outdoor WiFi to residents and visitors – It is continuously evolving and the areas that are covered (hotspots) are getting larger and larger. You get 300mb free outdoor broad band access for per person per day, if you use up all 300mb. you”ll get a slower connection, but it’s more than enough to check emails, read the news, get some tourist information and upload a couple of photos to Instagram. (And why not tag your photos with #appsolutelymilano?). In order to register (if you have a sim card) go to one of the Open WiFi Milano hotspots and fill in your phone number with country code, you get a free sms with your password and you’re good to go. If you haven’t got a sim card, in order to register you must go to an ATM Point (see the list below). Remember to bring valid picture ID (e.g. passport). 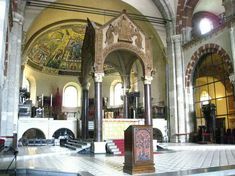 You can read all about the service here, the app GuidaMilano, tracks when you are within range of a WiFi hotspot, but please note that the information on the app about how to register are outdated. Duomo M1-M3, Monday-Saturday, 7.45 a.m.-8.00 p.m., Sunday 10.15 a.m. -1.15 p.m. and 2.00 a.m.-5.30 p.m.
Centrale M2-M3, Monday-Saturday, 7.45 a.m.-8.00 p.m., Sunday 10.15 a.m. -1.15 p.m. and 2.00 a.m.-5.30 p.m.
Cadorna M1-M2, Monday-Saturday, 7.45 a.m.-8.00 p.m., Sunday 10.15 a.m. -1.15 p.m. and 2.00 a.m.-5.30 p.m.
Garibaldi M2, Monday-Saturday 7.45 a.m.-8.00 p.m.
Loreto M1-M2, Monday-Saturday 7.45 a.m.-8.00 p.m.
Romolo M2, Monday-Saturday 7.45 a.m.-8.00 p.m.
Besdes this network many shops and cafés have their own open WiFi networks you can access. locations for charging batteries. Some have been set up by A2A (Milan’s power company) and others by the municipality.So far Phase 1 has been completed with 15 purple so-called digital islands, where Milanese and tourists can sit down, relax and charge their smartphones. You can’t say Milan without mentioning La Scala; opera, Giuseppe Verdi, ballet and the Orchestra Filarmonica della Scala. Are you into opera there is a real insider trick to getting tickets at only €12. Opera and Ballet Evening Performances. 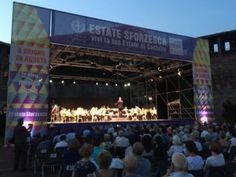 The list will be filled out and tickets handed out at the Evening Box Office (find on map) office at 5.00 p.m. – remember that every person interested in a ticket must be physically present at this hour. The list will be filled out and tickets handed out at the Evening Box Office (find on map) office at 12.00 p.m. – remember that every person interested in a ticket must be physically present at this hour. Normal admissions range from €18-2,000 depending on the performance you are interested in and where you want to sit, you can get more information about this here. It is a good idea to buy your tickets online in advance in case you already know you want to go, reservations and online purchase can be made here. Another possibility, for the more impulsive opera lover, who likes to live life dangerously, is to go to the central box office in Galleria del Sagrato, Piazza Del Duomo, Metro Station Duomo (open all days from 12 p.m.to 6 p.m.) and ask whether there are any tickets that have not been picked up for that evening’s performance. (find on map) but you should know that the most popular performances are sold out months ahead. Giuseppe Verdi built Casa Verdi as a home for retired musicians and he and his wife are themselvs buried in the crypt. The crypt can be visited every day at.8.30 a.m.-6 p.m., and it also possible for groups to visit Casa Verdi itself and its wonderful art collectionbut you need to book the tour in advance. The visit itself is free but it is custom to leave €3-5 as a a thank you. Casa Verdi is located on 29, Piazza Buonarotti (find on map). When you think Milan, we bet you automatically think fashion and beauty. Treat yourself to a manicure (Aveda manicure €22 including nail polish/€25 French) or a pedicure that will make your feet look amazing in those new sandals you just got (Aveda pedicure €45 including nail polish). Italians are incredibly skilled at styling hair but haircuts? Not-so-much. It is actually hard to find hairdressers that can cut other than thick, beautiful Italian hair. If you absolutely want a haircut, try either Toni&Guy, they’ve got 3 salons in Milan (remember to book an appointment) or Lepri hair spa, who only use organic products.They’ve also got a mini Spa, where you can get facial treatments, massages, manicures etc. It’s also a good idea to book appointments here. In Milan there is also a great and very beautiful Spa near Porta Romana QC Terme Milano where you can spend the whole day relaxing and swimming in the Thermal Water and get a massage – DaySpa25 includes the whole day in the Spa, a 25-minute massage and free buffet at €80, but you can put together your visit as you wish. 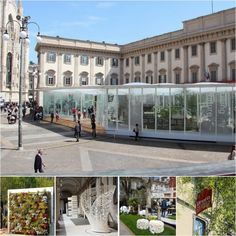 You’ll find the center on Piazza Medaglie D’Oro 2 (find on map). You should definitely visit one of the city’s many Erboristerie (herbalist’s) if you’re into all things natural, they sell great herbal medicine and beauty products and normally the personnel is very skilled and knowledgeable. When visiting Milan you should be drinking the local wine from Lombardy, which are part of the culinary tradition in the area. Lombardy has five DOCG (di origine controllata garantita – guaranteed and controlled origin) wines and we want to introduce them to you and give you some ideas of what kind of food each of them is good with and what to buy home from your trip. Our wine expert, certified sommelier Luisa Benetti has been an invaluable help here. 1. Franciacorta spumante, classical method. As the first Lombard DOCG wine we have chosen the very sophisticated white (or maybe even rosé) sparkling wine, a DOCG spumante. classical method – also known as the Champenoise Method that is produced in Franciacorta (Lombardy, province of Brescia). There are numerous quality wine producers, just to mention some of the most importantVisit the offical Franciacorta websiteones: Barone Pizzini, Bellavista, Berlucchi, Ca’ del Bosco, Contadi Castaldi, Il Mosnel, Monte Rossa. “Sparkling wine is a versatile wine that can be drunk with most typical Lombard dishes e.g. risotto with saffron and ossobuco, cold cuts and, obviously, seafood but it is actually also outstanding with pizza.” says sommelier Luisa Benetti. Some suggestions for those of you, who want to buy wine to take home. wine with a deep red glow you need to try out the Sforzato di Valtellina (or Sfursàt as it’s called in the local dialect in the province of Sondrio). This wine comes from the mountains where the so-called heroic viticulture has produced a very interesting DOCG, A wine produced of Nebbiolo grapes, that have first been let to wither , which may sound a little negative, but which results in a very robust wine, locally it is called Chiavennasca. “Lo Sfursàt is a robust and elegant win, which is aged in wooden barrels. It goes well with strong tasting meat dishes or aged cheese. But you can just as easily enjoy a glass after dinner” says Luisa.. Some of the best known producers are: Assoviuno, Bettini, Caven, Fay, Mamete Prevostini, Nera, Nino Negri, Plozza, Rainoldi, Triacca. 3. Oltrpò Pavese, classical method. Our third DOCG wine comes from the area south of Milan in the hills in the province of Pavia and is another sparkling wine this time . Oltrepò Pavese Metodo Classico DOCG (Champenoise Method). The main vine variety used is pinot nero which was brought here from France in the second half of the 19th century. For the fourth DOCG wine we return to the mountains in the province of Sondrio where we find a close relative to the Sforzato, an important red wine, the Valtellina Superiore DOCG. It comes from the same vine variety the Nebbiolo, locally called Chiavennasca, from the same valley and the same heroic viticulture as the Sforzato and the Valtellina Superiore is also aged in barrels But an important difference is that the grapes aren’t left to wither. If the label says ‘Riserva’ it means that it has been aged for at least three years..
Grumello – Inferno – Sassella – Valgella – Maroggia. “The Valtellina Superiore is intense and smooth and goes well with pizzoccheri alla Valtellinese or a dish of meat and porcino mushrooms.” Luisa says. Valtellina Superiore Inferno Riserva Fiamme Antiche 2010 – AR.PE.PE. Like any self-respecting chef would we finish off with the dessert wine, the smallest DOCG in Italy, a real gem; the Moscato di Scanzo, a sweet red passito wine. several weeks and the wine is aged for at least two years. Orange wine is apparently all the rage this year so what is it and which Italian labels produce them? They are the new rosé but rosé wine gets its colour from the skins of black grapes left to macerate for some time and then removed, so the wine doesn’t become red, whereas orange wines are made from white grapes and the macerating of the skins give them their spectacular colour, it is not a new process but a very old tradition indigenous to the Friuli Venezia Giulia region. They are perfect with raw fish, meat and venison. It may be hard to find in the wine bars right now but we assure you it is going to be a lot easier this autumn. Milan is big, but we have chosen the 6 areas that are the most interesting. For every area we’ll give you tips on good lunch restaurants, good cafés and the shops that are worth coming after. In the photo you see Milan’s brand new neighbourhood Porta Nuova, you also find the famous “Bosco Verticale” (vertical forest) behind Piazza Gae Aulenti. You must absolutely visit HightechCargo, a great store with furniture and objects for your home. In the rest of this area you find the quaint, trendy boutiques with the up-and-coming young designers where you can find cool, unique stuff. Shops: at 1, Piazza San Marco is the world’s best men’s shoes shop – Iliprandi (find on map). Thursdays there’s a characteristic open air market here with fruit, vegetables and clothes. #roundTheCorner Joost 2, Via Verdi (find on map) great design for both her and him. Via Solferino is a treasure trove of amazing, original boutiques (find on map), check out the unique clothes store Goods at 2, Via Castelfidardo (find on map) the concept is exclusivity, they sell their own range of silk shirts but also have other brands from France and Spain and they also have bags and shoes but they only have 3 sizes of each item in each colour and they don’t restock them but offer new items once they’ve sold the older ones, they also don’t do traditional sales but have regular discount days, the jewellery is also unique: 1 piece of each so you’ll never run into anyone with the same pair of earrings as you. Also check out the luxury outlet Outlet Matia’s in 4, Piazza Carlo Mirabello (find on map). High tech Cargo (find on map) is on Piazza XXV Aprile , where you’ll also find foodie paradise Eataly, which is housed in the converted Teatro Smeraldo. 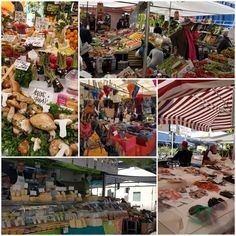 Here you can get regional specialties from small producers that you can take home with you, it is also a fantastic place to eat or just have coffee with pastries. If you want delicacies to take home with you try also in the brand new Esselunga supermaket situated beneath Piazza Gae Aulenti. From here you continue down super chic Corso Como – with the shop 10 Corso Como, which also houses the art gallery Galleria Carla Sozzani #LuxuryAndBeauty – which leads you into Milan’s brand new area Porta Nuova. Fashion blogger Chiara Ferragni @theblondesalad opens her new store on July 26th in Via Capelli, the short stretch between Corso Como and Piazza Gae Aulenti (find on map) #ChiaraFerragniCollection #ChiaraFerragniShoes. #RoundTheCorner you find the great laboratory and shop Arzigogolo, that makes very beautiful and original necklaces, earrings and textile bags at surprisingly affordable prices, it’s at 11, Via Maroncelli (find on map). Coffee:: Panarello, 52, Via della Moscova, great pastry!! (find on map), at the same address you also find Pattini and and 50 meters from there in the direction of Corso Como there is Radetzky with outdoor couches (find on map). We also recommend Fioraio Bianchi Caffè 7, Via Montebello. Panini Durini, 4, Piazza Gae Aulenti (find on map) super delicious sandwiches and coffee to-go, please note that it is situated below the square itself next to the Esselunga supermarket. 10 Corso Como Cozy courtyard, with good lunch. Pizzeria di Porta Garibaldi, 6, Corso Como (find on map). Panini Durini, 24, Via Mercato (find on map), delicious sandwiches, cakes and coffee to go. Pandenus, 24, Via Mercato (find on map), great lunch and aperitivo, breakfast every day from 7 am. 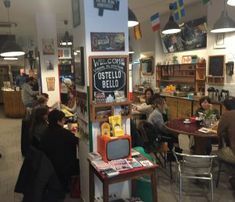 Café Gorille, 20, Via Gaetano de Castillia (find on map) a really cosy and beautiful café which is rich on atmosphere. Italian ice cream: Grom, Piazza Gae Aulenti (find on map) good concept and excellent icecream. Rivareno, 20, Via Mercato (find on map) – absolutely fabulous ice cream made with only fresh, natural ingredients and sweetened with cane sugar. The famous fashion quadrangle Quadrilatero della moda, which has its name after the four streets it is enclosed by: Via Montenapoleone, via Manzoni, Via della Spiga and Corso Venezia. 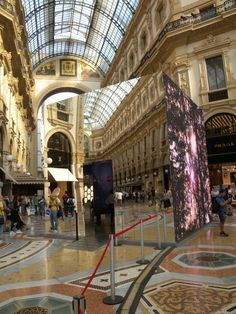 #LuxuryAndBeauty is really worth a trip, this is genuine old Milan and even though you may not be planning to go shopping here – go anyway and see it. Many of the boutiques are entire fashion shows in themselves. Also check out the luxury outlet Outlet Matia’s in 37, Corso Venezia (find on map). Coffee: While you’re here go and enjoy coffee at the charming Pastry shop Cova, 8, Via Montenapoleone with courtyard. Pastry shop Marchesi (find on map) one of Milan’s oldest pastry shops has opened a new shop here in 9, Via Montenapoleone. Another exclusive and very cosy restaurant in this area is Il Salumaio di Via Montenapoleone at 10, Via Santo Spirito (find on map) – this is also a great place to have a coffee break. Princi Bakery, Corso Venezia 21 (find on map) in principle this is a bakery but they prepare delicious lunch dishes: pasta, risotto and salads. Go early (before 12.30) because the place is normally packed!! Panini Durini, 26, Via Durini (find on map), small place but they make absolutely delicious sandwiches, soups, salads AND they’ve got incredible coffee (also to go) and cakes. #roundTheCorner : Via San Maurilio and Via Santa Marta with little boutiques. (find on map) e.g. Funky Table, 19, Via San Maurilio. #roundTheCorner: Via Giacomo Mora (find on map) where there are vintage shops andCavalli e Nastri one of Milan’s oldest vintage boutiques. In this street you also find Groupies Vintage and Lisa Corti #roundTheCorner who sells colourful tablecloths, bedspreads, blankets for you couch, ceramics and clothes. 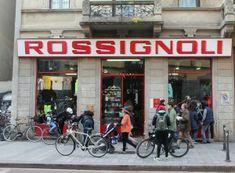 #roundTheCorner Corso di Porta Ticinese – street wear (great for teenagers), alternative design, vintage boutiques, this is a place where the Milanese themselves go browsing. #roundTheCorner Via Cesare Correnti an exciting area with various shops e.g. Joost. (find on map) great design for both her and him.This tour ends in Viale Papiniano,where there is a great open air market on Tuesdays 7.30 a.m.-1 p.m.and Saturdays 7.30 a.m.-5 p.m..
B Café, 20, Via Santa Marta. Caffè della Pusterla, 22, Via Edmondo de Amicis – great atmosphere (find on map). Pastry shop Marchesi (find on map) one of Milan’s oldest pastry shops located in 11/a, Via Santa Maria alla Porta . 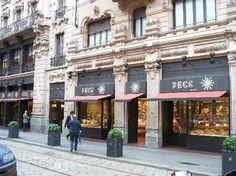 Lunch: Visit foodie temple Peck, (find on map) Milan’s no. 1 delicatessen and get an amazing lunch. Here you can enjoy a slice of pizza or foccacia. In Via Giacomo Mora (find on map) there are also a couple of cosy places for lunch. For tasty vegetarian food check out La Vecchia Latteria, 6, Via dell’Unione (find on map). Italian ice cream:: Grom, 51, Corso di Porta Ticinese (find on map) good concept and excellent ice cream. In this area you are the easy prey for street vendors who will try to make you buy books, bracelets and other stuff. They are really nice but once you start talking to them you won’t get away until you buy something. Ignore them, they’ll try to make you take a bracelet saying it’s a gift – DON’T TAKE IT (unless, of course, you want to buy it)! The regular High Street shops i.e. Brian & Barry – department store with an Eataly department. Boggi (great outfits for him), Diesel, Max & Co, Max Mara, Liu Jo,Sephora, Banana Republic, GAP, Intimissimi, Calzedonia, Yamamay, Kiko, La Rinascente – department store, Sisley, Guess, Swatch, Footlocker, Benetton, H&M, COS, … And Other Stories and Zara. Between our areas 4 and 2 you find Abercrombie & Fitch on the corner of Corso Matteotti, where you can find other really great shops, a favourite of ours is Moroni Gomma. Lunch; Luini – nte that they are closed in August – (they make Panzerotti – a kind of mini calzone either fried or baked, there’s normally a very long queue, but it’s very well organizedand fast and more importantly; it’s worth the wait, you can eat it picnic style on Piazza San Fedele (right behind – find on map), where you can enjoy coffee afterwards in the brand new Lavazza Store. There’s also the Italian version of burgers Mama Burger (find on map). Il Mercato del Duomo (food market, bistrot and restaurant with an incredible view over Piazza Duomo). If you want to see and be seen there are lots of outdoor places on Corso Vittorio Emanuele itself, Italians don’t go here, they are typical tourist traps. Worth mentioning is also Fratelli La Bufala, 8, Galleria San Carlo (find on map). On the same square you have Gino Sorbillo Neapolitan pizza in Milan. Crocetta, 5, Piazza Diaz (find on map) with excellent sandwiches, salads and first courses. Panini Durini, 4, Via Mengoni (find on map), delicious sandwiches, cakes and coffee to go. On the top floor of department store La Rinascente there are several restaurants, a food market and the most amazing view over Piazza del Duomo and the city. Coffee:: Try out the delicious coffee with whipped cream at San Carlo al Corso, on Piazza San Carlo (find on map) or sip it at the exclusive Gucci Café halfway in Galleria Vittorio Emanuele (find on map)where you also find Prada’s in-store coffeshop/pastry shop Marchesi on the first floor with an amazing view of the Galleria. Hidden behind the scaffolding in Piazza San Babila for the new metro line is a real gem Pascucci at 22, Corso Europa (find on map). They import their own blend of organic South American coffee, you can also get lunch here. Then there is the Lavazza Store on Piazza San Fedele (find on map). The biggest and first shop in the Japanese chain Muji, to have opened in Milan. In adjoining Via Lecco no. 2 (find on map) you find Lisa Corti #roundTheCorner who sells colourful tablecloths, bedspreads, blankets for you couch, ceramics and clothes and in Viale Tunisia there is the very interesting Carpediem shop. And, last but not least, at 6, Via Bernardino Ramazzini is one of the most interesting new openings East Market Shop – a spin-off of Milan’s absolute best flea market East Market – (find on map) – a must-see for vintage lovers. MINT Garden café, 12, Via Felice Casati (find on map) Really delicious lunch and brunch place. Capatoast, 4, Corso Buenos Aires – a delicious new concept 30 different toasts including vegetarian and vegan ones. (find on map). Pavé, 27, Via Felice Casati (find on map) – delicious lunch and great coffee. Grom, 13, Corso Buenos Aires (find on map) or 6, Piazza Argentina (find on map) good concept and excellent ice cream. Pavé Ice cream, 21, Via Cesare Battisti (find on map), fantastic homemade ice cream. This area is actually a shopping-route. 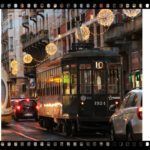 Start at Via Marghera – via Belfiori – Corso Vercelli – Corso Magenta – check out the luxury outlet Outlet Matia’s in 12, Corso Magenta (find on map) – with a detour to Via Vicenzo Monti and a cultural break to “The Last Supper” (you have to book tickets phone number +39 02 92800360) another must-see is art gallery/design store Spazio Rossana Orlandi at 14/16, Via Matteo Bandello which is just a little out of the way but so worth visiing. Shops: #roundTheCorner in 5, Via Luigi Sacco (find on map) Io & Meg different jewellery and clothes. Via Marghera here you find several shoe shops and varied clothes shops, outlets. OVS clothes shop H&M style. 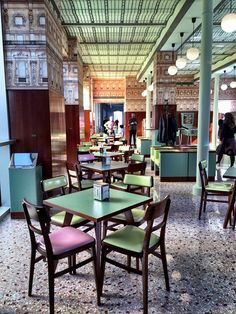 Coffee: Biffi pastry shop: Have coffee or #aperitivo old Milan style or try it in the small coffee shop at 36, Corso Vercelli , where you drink coffee while enjoying the smell of freshly ground coffee beans, and you can buy some for your espresso machine at home. Pizzeria da Gino,9, Corso Vercelli (find on map) Standing lunch with good pizza and ready meals. Panino Giusto, 8, Via Cherubini (find on map) quality sandwiches. 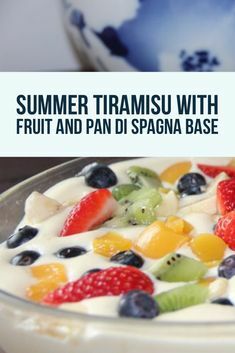 Fru.Eat on Piazzale Baracca (find on map) – lunch based on fruit and vegetables. Panini Durini,7, Via Buonarotti (find on map) delicious sandwiches, cakes and coffee to go. Panini Durini, 31, Corso Magenta (find on map), delicious sandwiches, cakes and coffee to go. Italian ice cream Grom, 1a, Via Alberto da Giussano (find on map) Good concept and excellent ice cream. If you’re into incredible bargains in clothes, shoes, bags and accessories it is actually worth your while to visit one of the many fashion outlets near Milan. Be prepared to spend a full day on it but most of the places are little villages with restaurants and cafés so you can get a fun day out of it. Fares are around €10,00 roundtrip and most of the companies give you vouchers to either the restaurants or some of the shops on top. Visit this newly opened shopping center in Locate di Triulzi (find on map) just 30 minutes from Piazza Reppubblica in the city center by the railroad link S13 (passante) and a 2/minute walk from the station. There are great brands like Karl Lagerfeld G-Star Raw, Twinset, Levi’s, Calvin Klein, Kartell, Alessi and many others at outlet prices. You can also get there by shuttle service from Largo Ciroli three times a day. The center is open Mondays-Wednesdays 10 a.m.-9 p.m. and Thursday-Sundays 10 a.m.-11 p.m.